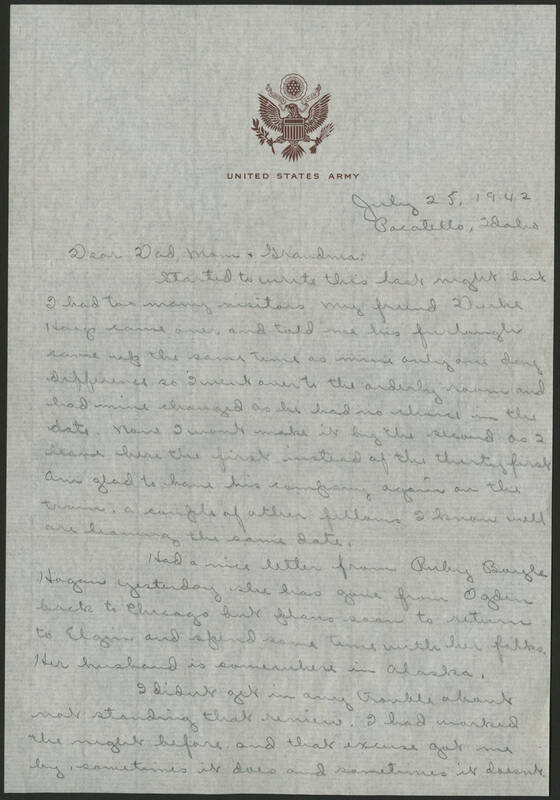 July 25, 1942 Pacatello, Idaho Dear Dad, Mom & Grandma: Started to write this last night but I had too many visitors. My friend Duke Hays came over and told me his furlough came up the same time as mine only one day difference so I went over to the orderly room and had mine changed as he had no choice in the date. Now I wont make it by the second as I have here the first instead of the thirty first Am glad to have his company again on the train, a couple of other fellows I know well are leaving the same date. Had a nice letter from Ruby Boyle Hagan yesterday she have gone from Ogden back to Chicago but plans soon to return to Elgin and spend some time with her folks. Her husband is somewhere in Alaska. I didnt get in any trouble about not standing that review. I had worked the night before and that excuse got me by, sometimes it does and sometimes it doesnt.